The issue of partisan gerrymandering is back before the Supreme Court today. 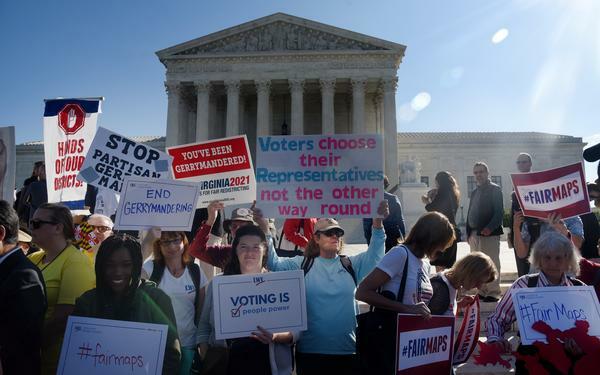 Once again, those seeking to break the political stranglehold over this process will be urging the justices to draw a line to stop both the Republican and Democratic parties from entrenching their political power. Two cases are before the court, from Maryland, a state under Democratic control, and from North Carolina, under Republican control. Here's NPR legal affairs correspondent Nina Totenberg. NINA TOTENBERG, BYLINE: For nearly two decades, people have been challenging partisan gerrymanders as unconstitutional, arguing that, at some point, enough is enough. Justice Anthony Kennedy was open to finding a way to limit the practice. But Kennedy retired last summer, leaving a far more conservative court, and diminished odds of success for the challengers in these cases. DAVID LEWIS: I propose that we draw the maps to give a partisan advantage to 10 Republicans and three Democrats. TOTENBERG: He fixed the number at 10 to 3, he said, because it was impossible to make it 11 to 2. The methods used by the North Carolina Republicans may have been more extreme, but they were the same ones the Democrats used in Maryland. It's called packing and cracking. In North Carolina, the Republicans packed as many Democrats as they could into three districts and then cracked other previously Democratic districts in half or thirds so that the Democratic vote would be spread out, diluted and subsumed in 10 safe Republican districts. Janet Hoy is co-president of the North Carolina League of Women Voters. JANET HOY: I think North Carolina A&T is probably one of the best examples we have of gerrymandering and how damaging it can really be. TOTENBERG: By cracking predominantly Democratic Greensboro, she notes, half the dormitories at historically black North Carolina Agricultural and Technical University were in one GOP district and half in the other. Today, in the Supreme Court, lawyer Emmet Bondurant is representing those challenging the redistricting in a very real sense. This is not a new fight for him. TOTENBERG: That was Bondurant in 1964 at age 26 arguing before the Supreme Court that the one-person, one-vote principle should apply to congressional districts. BONDURANT: This case really is a sequel. TOTENBERG: Now 82, Bondurant will tell the justices that while the original one-person, one-vote cases required legislative districts to be equal in population, partisan gerrymanders are making that landmark decision irrelevant. With political power so entrenched, he argues, the party out of power can't recruit good candidates, can't raise money or even interest its own voters in going to the polls. BONDURANT: The court has held that the election clause "prohibits a state from attempting to dictate electoral outcomes or favor or disfavor a class of candidates," end quote. What clearer definition could you have to outlaw partisan gerrymandering? TOTENBERG: That view prevailed in the lower courts. But today, lawyer Paul Clement, defending the Republican redistricting, will make this counter-argument. PAUL CLEMENT: The framers of the Constitution very consciously gave the authority to draw districts and make other election regulations to political entities. TOTENBERG: Specifically the state legislatures, subject to supervision by the Congress. CLEMENT: So trying to say that a certain degree of political gerrymandering or partisan gerrymandering is too much is trying to figure out, like, how much gambling in a casino is too much. BONDURANT: I like that analogy. BONDURANT: How much gaming in a casino in a state that prohibits casino gambling is too much? In the United States, the First Amendment prohibits viewpoint discrimination against people in political parties. It's not a question of degree. Government has a duty to design neutral rules of elections. The government has no business in putting its finger on that scale. TOTENBERG: The formula that Bondurant is proposing is easier to understand. It's that the North Carolina partisan gerrymander is quite simply an extreme statistical outlier. Bondurant points to studies conducted of alternative maps, as many as 24,000 alternative maps, that statisticians drew using the usual neutral factors like compactness and respect for local boundaries. ERIC LANDER: Computers, you know, provide a very simple way to see if the particular redistricting plan they chose is an extreme outlier. TOTENBERG: Dr. Eric Lander is a geneticist and specialist in analyzing large sets of data. He was one of the principal mappers of the Human Genome Project. LANDER: In the case of North Carolina, the map that the state chose is more extreme than 99 percent of all the possible maps you could have drawn. TOTENBERG: Happily, he says, North Carolina's redistricting is so extreme that the court for now doesn't have to go further in developing a standard. At some point in the future, it can develop a lower threshold. The scientific community, he observes, uses exactly these kinds of computer models to determine the probabilities of a hurricane hitting Miami or a nuclear plant being safe. The newly constituted conservative court majority, however, may well want to stay out of what judges sometimes call the political thicket. And there are procedural ways to do that. The court could, for instance, say that none of the voters here can show the kind of harm needed to sue. But if not these voters, then who? Paul Clement. CLEMENT: Well, it may be that nobody has standing to bring these kinds of claims. BONDURANT: If the court rules in favor of Mr. Clement, you are giving partisan state legislators what I will describe as a hunting license with no bag limits. TOTENBERG: And that, Bondurant maintains, would be catastrophic. Nina Totenberg, NPR News, Washington. (SOUNDBITE OF MENISCUS' "FIGHT CLUB") Transcript provided by NPR, Copyright NPR.